I have just developed a brand new web app which is well suited to those of you who build profile pages, or subscribe to Angelas, Pauls backlink packets etc. Even those of you who submit a LOT of articles. This downloadable web app allows you to enter a long list of profile urls that you built OR article urls of articles that you have submitted and got approved. With a single click of a button it then queries Google and checks to see which ones are indexed and which ones aren’t. It then displays your full list with either a tick or cross next to it. 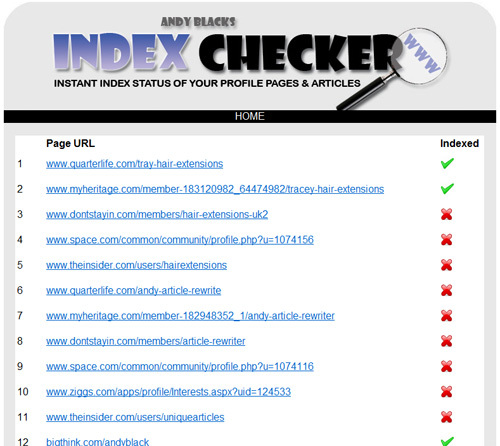 This will tell you at a glance which pages are indexed and which ones MAY need bookmarking etc to get them indexed. Remember this. 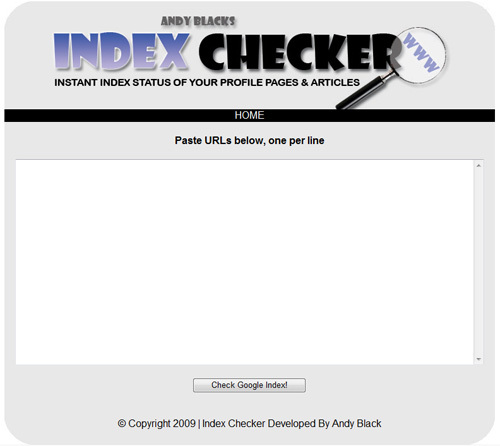 If your pages / articles are NOT in Googles index, your backlinks DON’T exist! Fact. Underneath the displayed urls it will tell you how many urls there were in total, how many urls are indexed and how many urls are not indexed. Underneath that is a text area that contains the complete list of urls that are NOT yet indexed. The app will automatically remove the indexed urls. You then simply copy and paste this list into a notepad documents or suchlike for future checking. This list is your ‘work in progress’ urls that are not yet indexed. As you build more profile pages or get more articles approved by article directories, simply add those urls to this list. Then periodically (once a week should be enough), run the current list of urls through the app again. The app will see which urls have been indexed and will ‘again’ remove them from the new list which it generates at the bottom. This app is a great tool to check that your profile pages and articles are getting indexed, and fantastic for letting you know which ones need some additional links or bookmarks to nudge them into Googles index. It is also great for quickly identifying profile type sites that gets their profile pages indexed quickly by Google without the need for bookmarking etc. This is a great way to collate a list of HOT, fast indexing sites for your other blogs and projects! Now this app is a downloadable web app which means you download it, unzip the file and upload it straight to your own hosting for your own personal use. I advise people to password protect the directory so that other people can’t find it and use it. This is to ensure that Google doesn’t temporarily block your server. To run this app ALL you need is for PHP and cURL to be running on your server. Most hosting companies have these installed as default. If for any reason cURL isn’t installed, just ask your host and they should install this for you for free. The app will be available shortly for only $7. You can’t get much cheaper than that! The sales page will be up shortly and will include a short video showing the tool in action. It is only a simple app, the it is useful and is a big time saver. Promote This Product And EARN 100% Instant Commission! I am also putting a system in place which will allow you to promote this product yourself and EARN 100% instant commission on every sale you generate. Paid straight into your Paypal account! You can promote this to your IM related marketing lists or via your blogs, websites etc. All ecovers and email templates will be supplied. All you have to do is spread the word and earn instant cash. Of course, this is only available to those that purchase this app in the first place. Once you purchase you’ll receive your special link. This app looks very helpful, and could save a lot of time. Will I be able to save this url list and add to it? Hi David. With it being an app that you upload to your own hosting I have kept it really simple so therefore have developed the tool so that it doesn’t require any database setup etc. That would be required in order to store the url list. My suggestion is to simply copy and paste the generated list to a notepad file and save it to your pc. I am also adding some other functionality to this app too so will be posting details shortly! Looks like a great tool. Can’t wait to get it. But on another note, what is the best way to get those types of pages indexed? Any software to help with that task? Looks like a great app, you should do well with this one. The SENuke crowd should lap this up – one of the biggest issues they seem to have is knowing whether their Web 2.0 properties are indexed. Being able to post a load of them and check in one go is great. You should get in touch with Areeb over there – I’m sure he’ll give it a push. Looking forward to it coming out anyway Andy. Looks good. Could it checks any kind of a web page? I’ve written a lot of articles in my blog mybestdecoratingtips.com . 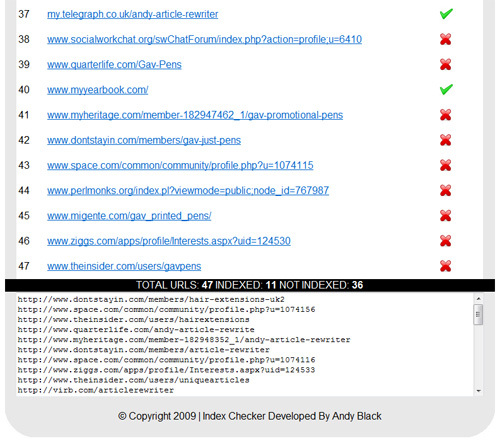 But with your tools I would be able to check whether my articles have been index or not. Just got the article pro I’m really excited about that as I have used so many and they do not work. 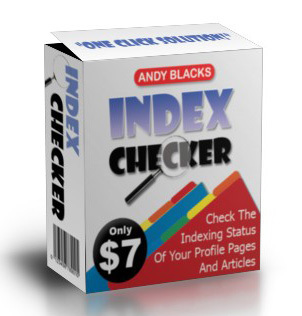 Also I really want to get the index checker how to I go about getting that? Please let me know. Thanks again – your products are great. Thanks for your email. It couldn’t have been more timely with the introduction of your two new back linking products. Let me tell you that I’m very new to all this back linking stuff. I am launching my very first website and I’m begining do understand how important the back links are. I guess the old saying, if you build it they’ll come is not really true. At least without back links it’s not. You just saved me from spending a lot of time a hard ache going about it the wrong way. Just reading your blog article on back linking has opened my eyes. There is a real science to all this back linking if you want it done right.